The Thames opposite the Royal Hospital, Greenwich. Photo © David Secombe, 2001. The inhabitants of Greenwich were amused by a man walking under the surface of the water in the Thames immediately opposite the Royal Hospital. A craft was moored off the stairs to which was affixed a ladder, down the steps of which the exhibitor descended to the water. He was dressed in a manner so as to exclude the water from penetrating, and upon his head he wore a sort of helmet which covered his face, and in which were two small bull’s eyes, whereby he was enabled to see. During the exhibition he remained under the water nearly twenty minutes. As far as I can tell, the above photo of a stricken Bart Simpson was taken exactly where the event described in this clipping from The Gentleman’s Magazine took place. One can only imagine the amount of sheer ordure than the intrepid aquanaut would have waded through in the course of his heroic feat, which took place over a quarter century before Joshua Bazalgette began his improvements to London’s sanitation by directing raw sewage underground and downstream. The buildings under construction on the Isle of Dogs are for Barclays Bank and HSBC, appropriately charmless additions to London’s skyline. 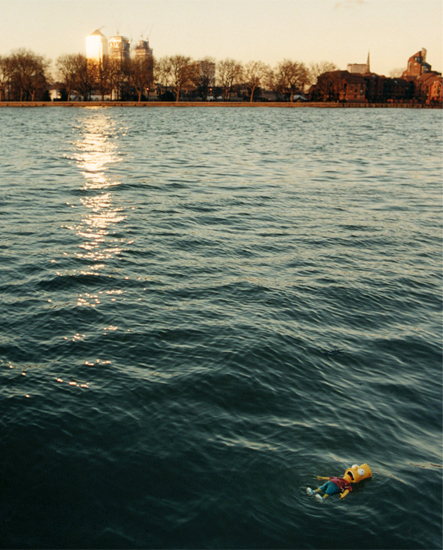 What Bart was doing in the Thames, I don’t know. Extremely fond of this photograph. from down under ..thanks for all your “observations” your Dad would be very proud of you!! Excellent. Looks like Bart’s having an existential moment. The Thames looks decidedly blue here! I appreciate that Graham, very kind of you. Best, David.